Home / All Posts / Hybrid Pencil Box Tutorial with FREE Templates! Have you seen thee little plastic pencil boxes that cost less than $1.00? 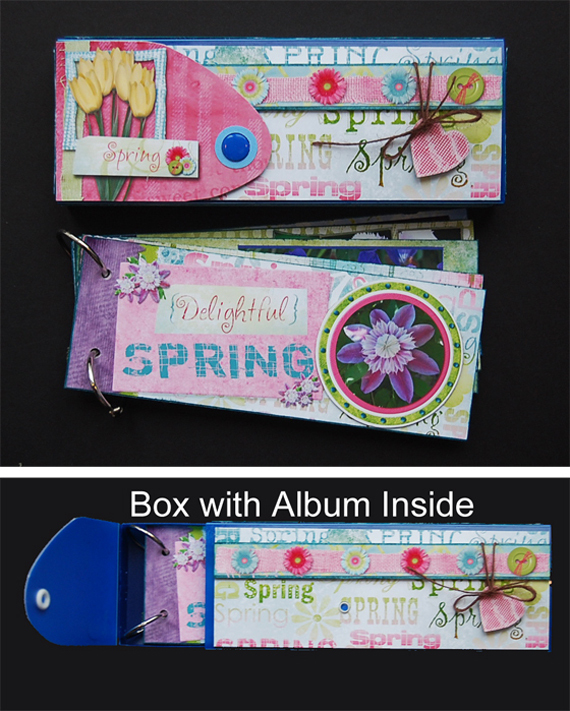 Not only are they perfect for holding your Stickles, but they can also be cute mini albums! I’m going to show you how to do that. 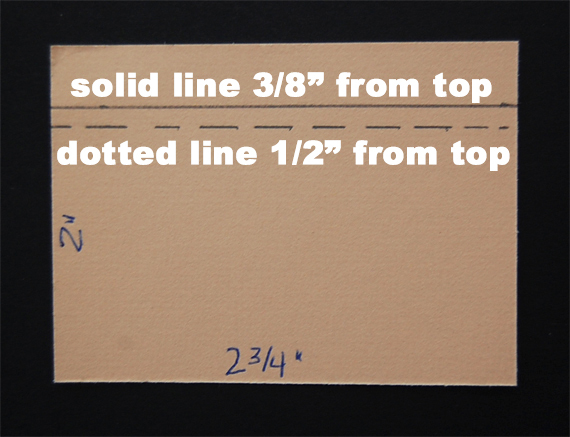 I’ve included two templates to help you with the positioning of the snap holes. I’ve since noticed that some boxes have a different shape for the opening flap. You’ll want to make sure you get one shaped like mine or you can tweak these instructions to fit your shape. 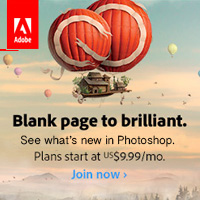 I work in Photoshop CS5 so the first thing I do is open up the template: Template_PencilBox_Top. 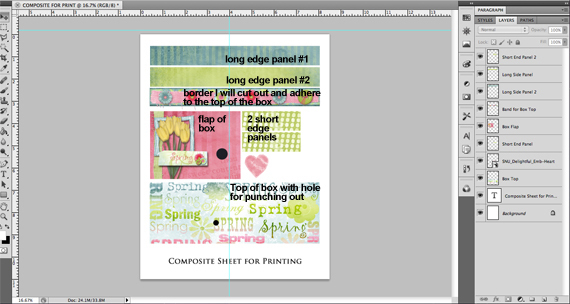 I’m going to use the Spring paper from the Delightful digital kit, so I open that file and use my rectangular marquee tool to select a section that is 6-5/8 x 2-3/4″ inches from the paper; change to my Move Tool and drag that selection over and drop it into my new file. I can now move it under the shape layer and save my new file as Pencil Box Top – your black circle for punching should be showing, if it is not, then you’ll need to move your new layer under the shape layer. I want to use the same paper for the back so while I’m still in my PS file of Pencil Box Top I go to File>Save As and name it Pencil Box Bottom, delete the shape layer and resave it. Now you should have the panel of paper without the black circle on it. For the flap piece of the box I open the Template_PencilBox_Flap and follow the same steps as I did with the Pencil Box Top above. For the long side panels I’ll open a new PS file that is 7-5/8 x 7/8 inches and save it as Pencil Box Long Side. I’ve chosen to use two different papers for my sides. If you use the same paper for both sides you can just print out 2 copies of the one file. 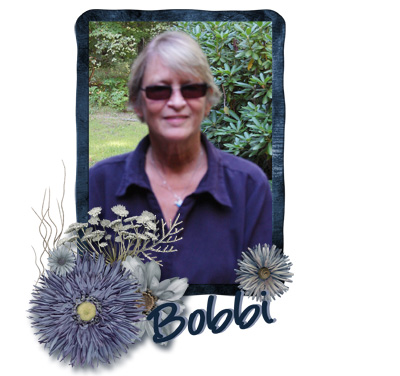 Do the same for the two short end panels – with their size being 3-5/8 x 7/8 inches. Close out the original digital paper windows and templates without saving any changes. 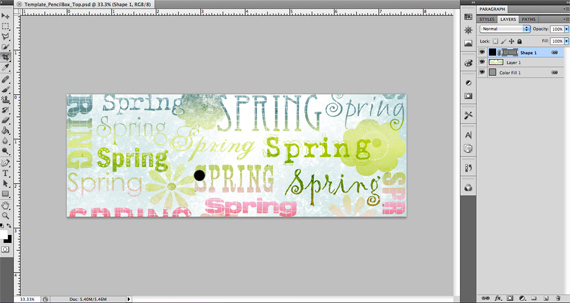 Now I can decorate the files with embellishments and when I get the look I want I’ll resave them. The first panel I’m going to work on is the top of the box. I’ve cut my panel down to size, used a ¼” inch circle to punch out the black circle, and adhered the panel to the top of my pencil box. 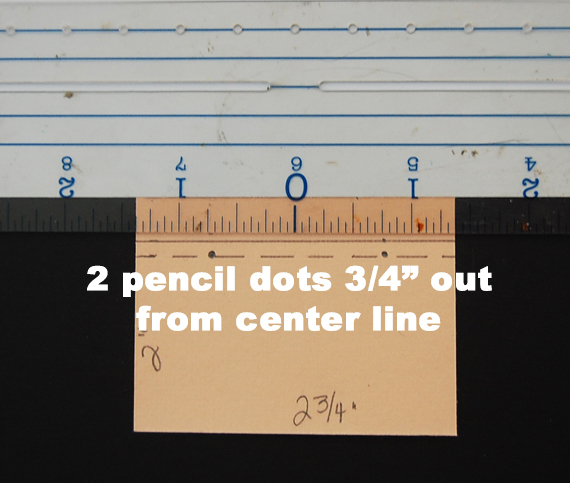 My 5/8” circle punch will reach in far enough so I turn it upside down and center it around the ½” dot on the paper and punch it out. I adhere the paper to my pencil box flap, positioning the snap’s top in the center of my punched out hole – the hole is going to be too big for the snap, but don’t worry we’re going to fix that next. 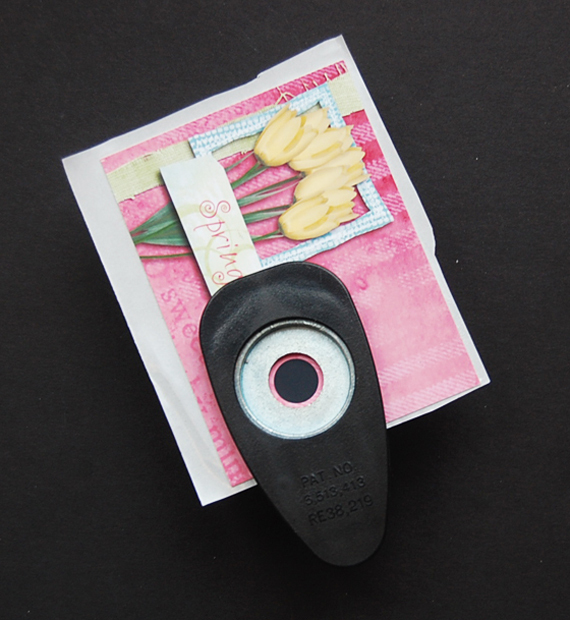 Trim the excess paper off the flap with an xacto knife or scissors. To cover the space around the snap I used a scrap of paper and punched a ¼” inch hole in it. 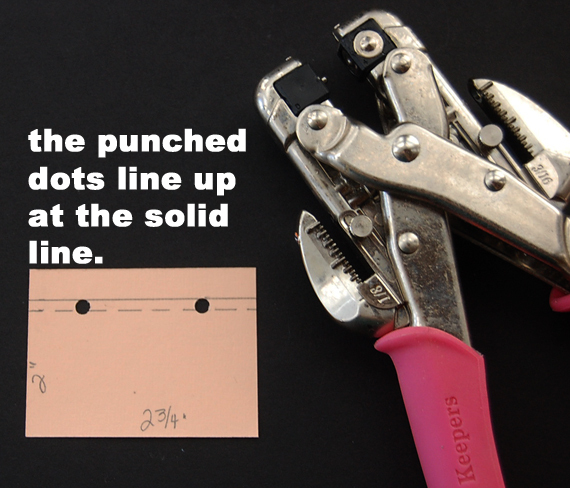 Then I took a ¾” inch circle punch, turned it upside down and centered it around the ¼” inch hole and punched; giving me what looks like one of those reinforcement thingies we used years ago, remember them? 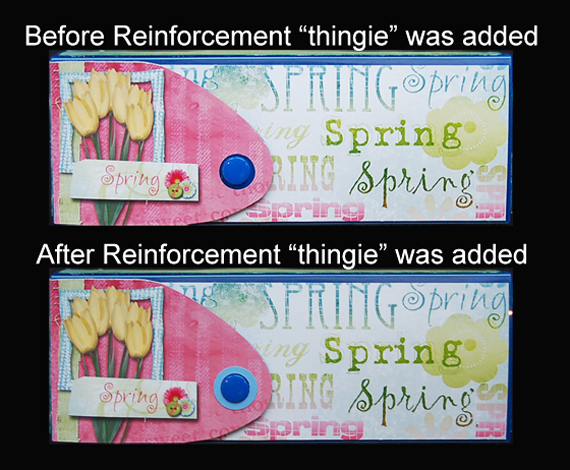 This reinforcement piece will now slide right down over your snap and make it look perfect! Of course, if you have a ½” circle punch that will reach far enough in then you won’t need to do these steps. 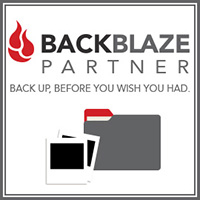 But it’s always nice to have a back up plan. I want to add some dimension to my box top. The band with the flowers is printed out separately from the top of the box background. To give it a little more weight I’m adhering that to a piece of card stock and will attach it with some foam tape or pop dots. I’ve cut my heart embellishment out, punched a small hole in it and run a string through. Now I can wrap the rest of the string around the band with flowers and attached it all to the top of my box. To keep my heart in position I used another pop dot. The side, end and back panels are going to remain just as they are, so are cut out and adhered to the box. Now my box is complete and I can work on my album. 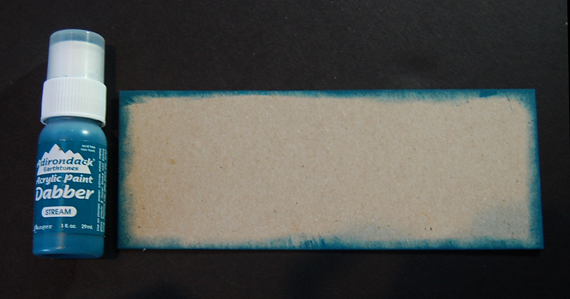 Cut 5 panels of chipboard down to 7-1/4 x 2-3/4” inches and use acrylic paint to add color around the edges. This is optional but I like to do it so there is no gray chipboard showing on the cut ends and if I mess up <gasp> and undercut my digital panels slightly. 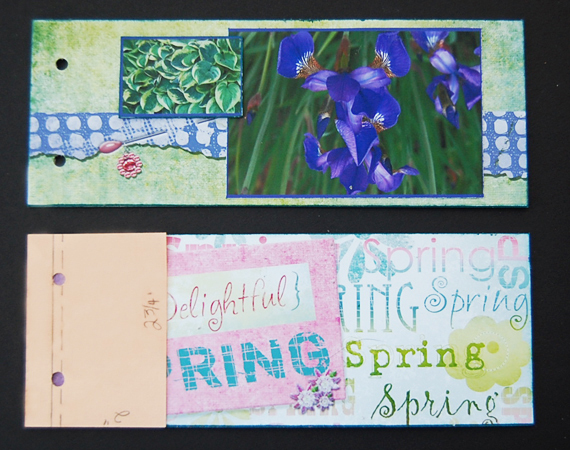 Open up a new 7-1/4 x 2-3/4” inches PS file, choose a background paper, add digital scrapbook supplies and save. You’ll need a front cover, back cover and 8 inside pages for the album. My pages are done so I print them out, trim them down to size and adhere them the chipboard pieces. I wanted to add dimension to some of the pages so I printed out my photographs separately on glossy photo paper and mounted a few of them on chipboard – it lifts them off the page just a bit. I only did it to a couple of pages as I didn’t want my album to be so thick it wouldn’t fit into the pencil box. Cut a piece of scrap card stock the same height as the chipboard pages (2-3/4” tall) and wide enough to allow for the holes, in this instance I went with 2” inches wide. I’m kind of fussy so I use a centering ruler to determine where my holes will be. Punch the holes using the solid line as a guide to line up the edges of the holes. Line your template up with the left end of your cover and punch the holes – repeating this until all your pages are punched. The We R Memory Keepers’ Croc-A-Dile tool is great for punching these holes as it goes through chipboard like butter, but you can use any punch that works. 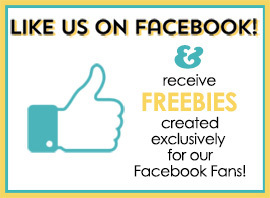 Insert the two rings to hold your pages together and your Hybrid Pencil Box album is ready to store in its own box. My next pencil box album will be for my granddaughter. I’ll leave the pages fairly simple and she can glue in school photos of her friends. You can also check out my personal gallery (Nanab99) on the Scrap Girls site for other samples of these. I hope you enjoyed this tutorial and will make your own samples and post them to the Scrap Girls Hybrid Gallery so we can all enjoy them.